First grape harvest at the Eco-Justice Center in Racine, Wisconsin. 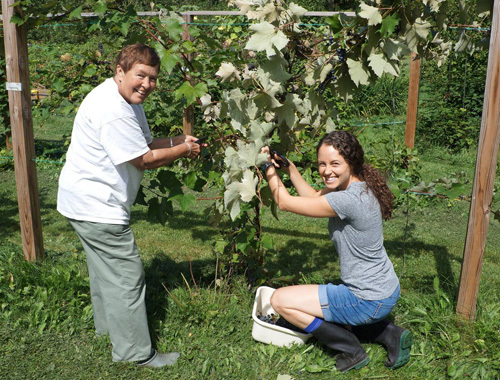 Picking grapes (from left): Sister Janet Weyker, OP (Racine) and Sister Christin Tomy, OP (Sinsinawa). The Eco-Justice Center, a ministry of the Racine (Wisconsin) Dominican Sisters, will celebrate its annual Fall Festival on Sunday, Sept. 20. Bring the family and enjoy live music, delicious food, demonstrations, pony rides, hay rides, a petting zoo and kids’ games. This year, artists will be stationed around the farm for Plein Air Painting. Other demonstrations will include spinning, weaving, apple pressing, wood turning, green cleaning, calligraphy, and bee keeping.